Upper end of Crystal Lake basin as viewed and photographed by helicopter pilot Jeff McNabb, flying above Islip Ridge looking east. The heart of the basin was largely spared from the desvestation of the Curve Fire, September 2002, but much of surrounding slopes were incinerated. 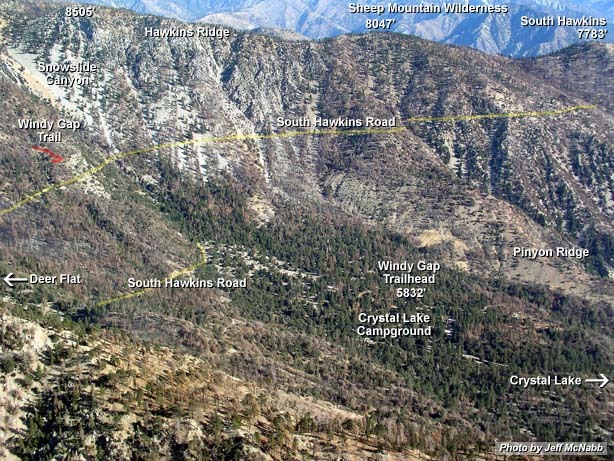 The red line shows a visible part of Windy Gap Trail about two tenth of a mile past the South Hawkins Road (See zoomed in view). The distance from the trailhead to the second crossing of the road is 1.1 miles, and then another 1.4 miles to Windly Gap. This page was last updated October 19, 2004.